DVEO, the broadcast division of Computer Modules, Inc. (CMI), will feature numerous innovative new products at two exhibitions this month: TelcoTV, October 25-26 in Las Vegas, Nevada, at booth 631, and Streaming Media West, October 30-31 in Los Angeles, California, at booth 47. Designed for Telco TV, IPTV, cable TV, A/V systems, or university and entertainment systems, the MultiStreamer Brutus I IP/IP is a broadcast quality, 1-10 dual 8 core (Intel Xeon E5-2690) CPU blade based real time, multi definition, multichannel IP transcoder and/or streamer. Each of the up to ten Brutus modules transcodes up to 10 1080i/p HD streams, 20 720p HD streams, or 40 SD streams from MPEG-2 to H.264, or vice-versa. That's 100 1080i/p HD streams, or 200 720p HD streams, or 400 SD streams, in a 4 RU rack space. And while some competitors' systems transcode only SD or HD, DVEO builds one machine that does any resolution. The system is also available in a two blade 1 RU system that transcodes up to 20 1080i/p HD streams, 40 720p HD streams, or 80 SD streams – the MultiStreamer Brutus III IP/IP. A media playout server for stored content, the Infinity Streamer streams multiple HLS video files, plus audio files, from the on board .5 terabyte hard drive, with scheduled playlists. With SSD, the system can output up to 50 IP streams at the same time, with different bit rates and wrappers for each stream. The input of the stored content typically arrives via FTP file transfer, and the files to be played are stored on the server. Input can be individual files or multiple files. Numerous file types are supported, including H.264 ts, flv, H.264 ps, .mov, VC-1 (.wmv), mkv, and others. The Infinity Streamer adds various "Wrappers" such as HLS, RTMP, RTSP, etc. It also supports loopable playback. The system is ideal for web sites, classroom use, or corporate channels. DVEO's broadcast quality branding and ad insertion system, the Ad Serter IP/ASI/SDI, enables broadcasters, Telco TV, IPTV, and cable operators to "brand" their video content with images that are not that easily removed. Operators can increase revenue by inserting graphical local ads in existing content. They can also add sidebars and scrolling text for crawling messages, weather bulletins, and emergency alerts. The Ad Serter inserts images and text anywhere on SD live streams with any degree of transparency. (Optional HD plus SD versions are available.) Three versions are available – IP input and output, DVB-ASI input and output, or SDI input and output. Graphics, logos, and text can be static, blinking, or rotating. And in case of video input failure, the Ad Serter can mask the entire screen with a static image. DVEO can also create customized systems to meet customers’ needs. The MultiStreamer DIG/IP (micro) is DVEO's latest – and smallest – addition to the MultiStreamer product family of real time streaming appliances that deliver content to iPads, laptops, OTT televisions, and mobile devices via IP. It accepts uncompressed SDI or HD-SDI video (or optional HDMI or analog) from cameras, editing systems, or video servers, and supports simultaneous IP input. The micro creates multiple simultaneous high, medium, and low bitrate IP streams with wrappers such as HLS, RTMP, RTSP, etc. The Linux® based system encodes up to two 1080i/p streams, or one 1080 i/p and one 720p HD stream, at 6 Mbps; or six SD streams at 2 Mbps. The micro weighs just five pounds – 2.27 kilograms – and is only 9.8 inches/25 centimeters long. The D-Streamer IP/DIG is a real time H.264 or MPEG-2 decoder that receives IP transport streams and decodes them to SDI or HD-SDI, or optional HDMI. It accepts a wide variety of IP protocols, wrappers, and containers but is highly tuned for HLS and RTSP. Broadcasters and content providers can use DVEO's MultiStreamer DIG/IP to encode SDI or HD-SDI to H.264 IP, then decode the streams with the D-Streamer IP/DIG. The D-Streamer IP/DIG is available in two versions – single channel input, or 4-12 channel input. The system is ideal for receiving and professionally decoding "poor looking" video from IP cameras, remote sites, content delivery networks (CDNs), or IPTV compatible appliances or players. A portable video production and streaming unit in a rolling rackmount TSA certified case, the MultiStreamer Flypack allows any production company or streaming service provider to pack up and go to any event anywhere in the world. It includes an integrated MultiStreamer audio/video streaming encoder, compact seamless video switcher with effects generator, plus preview and program monitors. The Flypack can be customized to include DVEO's Xaris™ playout server, Ad Serter, DelayServer/IP, and/or the new Infinity Streamer VOD server. Inputs from a camera or other system are multiple HD-SDI and HDMI, or DVI. The unit is available in 4RU, 6RU, or 8RU rolling rack cases, plus optional Shockmount versions up to 12 RU. The MultiStreamer Flypack is ideal for live productions and events like concerts, electronic news gathering (ENG), educational webcasts, political campaigns, and more. The DelayServer IP is a stand alone IP to IP delaying file server that re-streams 40+ MPEG-2 or H.264 IP transport streams and plays them back after a delay that is finely adjustable from seconds to hours. Capture and playback can be simultaneous on multiple streams. Users can adjust the delay times "on the fly", as the system is recording and/or playing out. The standard unit ships with a .25 terabyte Intel® high end SSD. Product options include additional storage capacity, and unicast to multicast conversion. "We are excited to be exhibiting at TelcoTV and Streaming Media West," said Laszlo Zoltan, Sales Manager for DVEO. 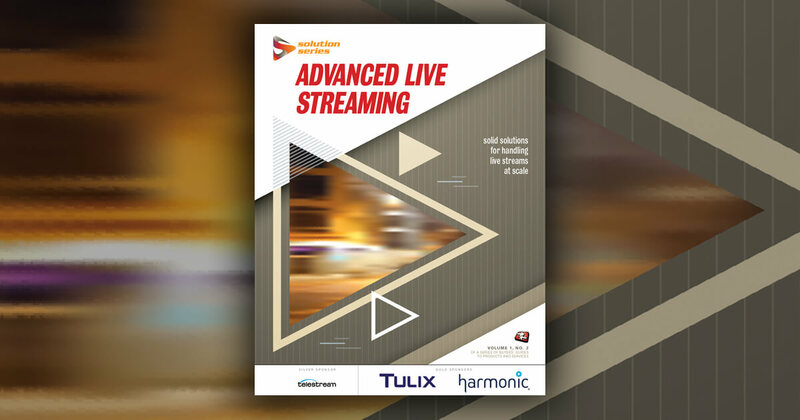 "Both shows are important venues for showing customers our leading edge products for streaming, transcoding, encoding, ad insertion, and more." MultiStreamer DIG/IP, MultiStreamer Flypack, and Xaris are trademarks of Computer Modules, Inc. Ad Serter IP/ASI/SDI (SD only): $7,995 U.S. Ad Serter IP/ASI/SDI (SD plus HD): $8,495 U.S.
D-Streamer IP/DIG (mini, single channel): $3,995 U.S.
Infinity Streamer (mini) .5T/50ch: $4,995 U.S.
MultiStreamer Analog/IP (micro): $4,995 U.S.
MultiStreamer Brutus I IP/IP/10 channel System with 10 modules: $125,000 U.S. Individual MultiStreamer IP/IP (Brutus) Module: $12,500 U.S.
MultiStreamer Brutus III IP/IP: $17,995 U.S.
MultiStreamer DIG/IP (micro): $4,995 U.S.
MultiStreamer HDMI/IP (micro): $4,995 U.S.
For more information on CMI and DVEO, please contact Rebecca Gray at +1 (858) 613-1818 or rebecca@dveo.com. To download DVEO's press releases and product images, visit the news section at www.dveo.com.